Football fans' groups will deliver a letter to a Premier League club owners' meeting on Thursday, calling for a boost to away ticket funding. The Away Fans' Initiative provides £200,000 to each Premier League club, but fans want this to reach £1m next season as a new £5.14bn TV deal begins. Supporters say that will allow clubs to charge £20 for all away tickets. "A fraction of that income could make a huge difference," said the Football Supporters' Federation's Kevin Miles. "Thanks to their colossal media deal, Premier League clubs will be billions of pounds richer than they were only a few seasons ago, and they weren't exactly poor then. "If you look at the increase in the domestic media deal alone, it equates to more than £40 for every single fan, at every single game, over the three-season deal. "There is simply no excuse for them not doing more for football's loyal supporters." As Premier League shareholders gather in London on Thursday, fans from Chelsea, Everton, Liverpool, Manchester United, Stoke City, Sunderland and Spurs will hand over the letter. The call to reduce away ticket prices comes after a coordinated protest across Premier League and Football League clubs in October as part of the FSF's 'Twenty's Plenty' initiative. 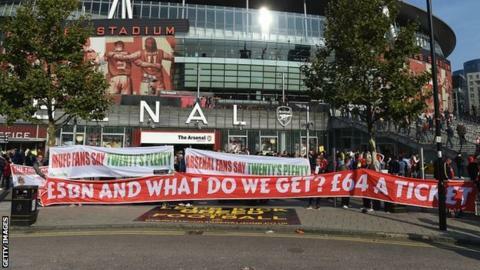 A Bayern Munich fans' group also turned up late for their Champions League group match at Arsenal in protest at ticket prices for the game. The Premier League insists that clubs have a "huge number of offers" for supporters to make tickets more affordable and says occupancy at stadiums has been at 95.9% for the past two seasons. The FSF says the 'Twenty's Plenty' campaign has already led to 68,000 fans saving a total of £738,000 over the past two seasons through reciprocal deals, where clubs agree to cap each other's away-ticket prices.